One of the objectives of the Book of Me Scrapbook Layouts is to allow you to see for yourself how others see you and your accomplishments. I picked November for this challenge as I think this a good month to start thinking of all you have accomplished - stand tall and understand just how what you do for others and for yourself. So, how did you get where you are? Be Thankful for what you have and move forward into the Holidays with a new attitude about yourself and just see if your Holidays aren't a little more rewarding. And, be thinking about new Book of Me Scrapbook Layout ideas all on your own. Photo and Scrapbook Layout ideas: Where you went to school or where you wanted to go - there may even be some available on the internet. Well, here is another example of a Book of Me Scrapbook layout that took it's own turn. The point here was that I graduated from the same college as my mother, 30 years later and even wore the same white dress. 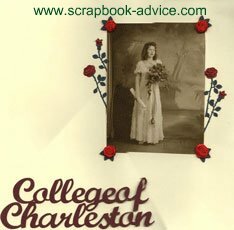 Graduates for the College of Charleston do not wear caps and gowns, but rather long white dresses for the women and black tuxedos for the men. The women carry a bouquet of red roses. For the Book of Me Scrapbook Layouts, my efforts to show the two of us together, 30 years apart, and in the same dress, was foiled by the fact that there were no graduation photos of me! But since the scene was the same and the dress was the same, I could have photo shopped my face onto one of the photos, but when I did this layout, Photo Shop was not available. The rose photo corners, the roses and the bouquet box here were from Jolee's. The large rose was a greeting card from Barnes & Noble. The "College of Charleston" was cut from Maroon card stock (the school color)on my Wishblade cutter. Option #2 - YOUR ROLE MODELS - Look back on your life and think about the person(s) who influenced you the most, perhaps a parent, a teacher, a coach, or a friend. Someone who supported you, encouraged you, helped you set your values. You might not have a photo of this special person, so this might have to be a journaling-only layout. Those who read our books need to know how we got where we are today and that they, too, can influence others' lives. Photo and Scrapbook Layout ideas: a photo of the person who was your role model. You, too, are a role model for someone else - a discovery from the Book-of-Me! Option #3 - YOUR ACCOMPLISHMENTS - Succeeding at one thing gives us the confidence to try something else, leading to more accomplishments. What have you done that you are proud of? Did you marry just the right man? Are you proud of the job you did, or are doing, raising your children? Did you get the perfect job? Are you an accomplished photographer, quilter, cook, paper crafter? Have you worked hard toward a goal and are reaping the rewards? Make a layout showing those accomplishments you are proud of. Photo and Layout ideas: You with your children, significant other, doing your hobby or craft or business. I hope your Book of Me pages are getting done and into those scrpabook photo albums. Remember sometimes it's about the author.